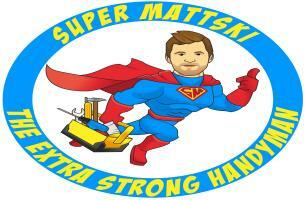 Super Mattski Limited - Home Improvements, Painter/Decorator based in Worthing, West Sussex. What's been your experience with builders? So how is Super Mattski so different? First off, he’s stronger… no, he really is. When he’s not working, Matt competes at strongman events and he’s a winner. Which means he knows all about hard work and discipline. He’ll get to your job early and finish late. Coffee and lunch (brought with him) are done on the job. 8 hours is not the standard day (unless you want it that way). 10 hours is standard (or more if it’s needed or wanted). So if you've had the rest, time to try the best and give Matt a call today to discuss your project. Check out the full list of services and get in touch to make an appointment for a free quote. Have an unusual job not on the list? Great, Super Mattski loves a challenge. Just let him know how he can help.